MRPMK Community Resource Fair – A health & wellness extravaganza! A health & wellness extravaganza! Register NOW for the 2016 Community Resource Fair for early bird registration. 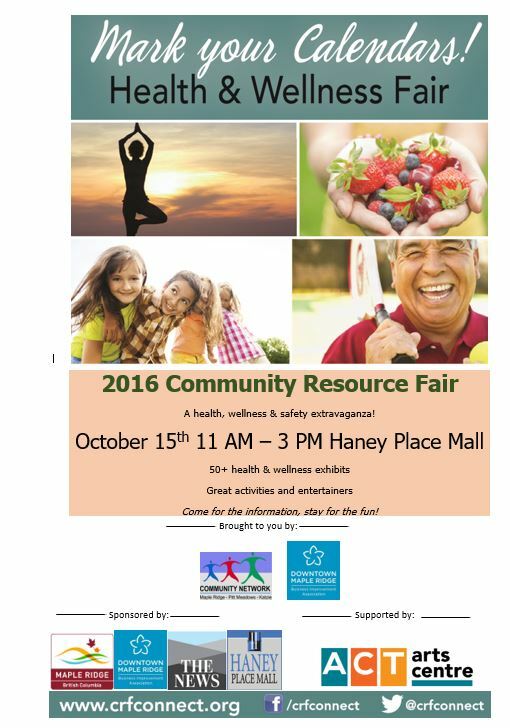 October 15th, 2016 from 11 AM – 3 PM at the Haney Place Mall. Please read 2016 CRF Registration Letter to learn more about participation guidelines and insurance requirements. Be sure to register early as registration is on a first come, first serve basis. This annual health and wellness fair brings together over 50 local community organizations and DMRBIA members who provide health and wellness services for children, youth, families, adults, or seniors. If you have questions please contact the, Fair Coordinator at info@crfconnect.org or call 778-317-0399. Register NOW for the 2015 Community Resource Fair. Please read 2015 CRF Registration Letter to learn more about participation guidelines and insurance requirements. Questions? Contact Lily Laverton, Fair Coordinator at info@crfconnect.org or call 778-317-0399. The 2014 Community Resource Fair has come and gone. Feedback and evaluations show that once again the event was a success! A special thank you to all of our Exhibitors for creating interactive displays that drew visitors in. I heard that there was lots to do and lots to learn. Great displays. It was a pleasure working with each of you to get you to the event and make sure that everything you needed was in place for the event. To the Elspeth Bowers, Nic and Rachel Renaud, Brianna Carlson, Bob Sutherland & Frank Schartinger, Nicole Chambers, Making Faces Face Painters, and Click and Clown for keeping the crowds entertained and happy. Thank you to the Maple Ridge Pitt Meadows Arts Council for the grant that allowed us to bring these wonderful entertainers to our event. They were all amazing! To our Volunteers who came from the community, local high schools, PLEA, ISS of BC, and all walks of life to help us make this event so successful. Several exhibitors noted that your enthusiasm and eagerness to help were a definite value-added for the event. Of special note were our volunteer Entertainment Coordinator – Jetty and Volunteer Coordinators – Lynne and Crystal, who helped keep things running smoothly on the day of the event. To the Organization Committee – what a great team! Everyone contributed, everyone shared, and everyone had some great ideas. The event wouldn’t be nearly as successful or cost-effective without your collaborative spirit! Keep up the good work. Sharon and Bob – I would like to offer up a special thank you for stepping in to manage all the preliminary planning pieces and day-of activities that I couldn’t do from my couch and computer. You are both amazing! To the organizations who HOST the event every year: Ridge Meadows Fall Prevention, Maple Ridge, Pitt Meadows, Katzie Community Network, and the Downtown Maple Ridge Business Improvement Association. Your leadership continues to bring an important community event to life. Thank you! To our sponsors – City of Maple Ridge, Social Planning, Vancity, The News, Haney Place Mall, and Downtown Maple Ridge Business Improvement Association – who provide the financial backing to continue to offer this fabulous health and wellness fair in our community, a resounding THANK YOU! Looking forward to seeing you all at the Community Resource Fair in 2015 on October 17th! Last minute planning is underway for the Community Resource Fair on October 18th at the Haney Place Mall. Entertainers are being confirmed. Volunteers recruited and assigned. Last minute marketing being coordinated. It’s all coming together quite nicely. With over 50 different health and wellness exhibitors everyone in your family is sure to find some great information and enjoy the interactive booths. Exhibitor services range from: parenting education, emergency services, services for new immigrants, assistance with finding employment, aboriginal supports, help with addictions, home services for seniors, help managing your money, help accessing appropriate free and low-cost legal assistance… the list can go on. To learn more about who is coming check out: check out link to the left: 2014 Community Resource Fair Participants. Exhibitors booths will be as varied as the types of services they offer, however, each booth will be interactive and provide some great information. Learn about the Emergency Vail at the Fall Prevention booth, make a button at the Downtown Maple Ridge Business Improvement Associations booth, sign up for a workshop on managing your money at the Vancity booth, take in a story at the Fraser Valley Regional Library booth, spin the wheel and win a prize at the Ridge Meadows Senior’s Society booth, or “take a walk in the shoes” of a homeless person to learn about situations that they encounter on a daily basis at Alouette Home Start booth. There is lots to learn and experience about your health & wellness, and that of other residents, at the Community Resource Fair. Our entertainment line up starts at 11:15 at Centre Court of the Haney Place Mall. In between visiting the booths and learning about health and wellness, take a moment to enjoy some local talent. Listen to local youth musicians, Nic and Rachel Renaud; lose yourself in the moment with local magician, Brianna Carlson’s magic show; get lost in the stories shared by Elspeth Bowers, Master Pupetteer and Storyteller; engage your toddlers and the child within you at a presentation of Mother Goose, hosted by Cytheria Transition House; or become an fall-prevention advocate, by learning about how your family can remove obstacles and keep the seniors in your life safe from falling hosted by Ridge Meadows Fall Prevention. Watch our website, Twitter, and Facebook accounts for more information this week. 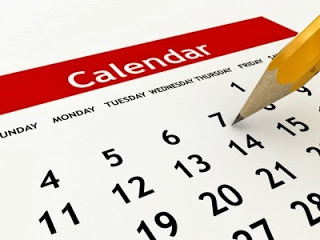 Keep an eye out on our social media streams @crfconnect on Twitter and /CRFConnect on Facebook to catch the last minute announcements on entertainers, activities, and other important information. The Community Resource Fair marketing materials are sporting a new look thanks to the Maple Ridge News. Charged with creating an eye catching ad, Carly at the NEWs created a totally new look for @crfconnect. We liked it so much that we’ve adopted it and used it as a template for our posters, rack cards, and tray liners. Next year, the new look will hopefully be reflected in this website as well. Thanks Carly and Lisa at the News for all your hard work, eye for graphics / design, and for sharing your work and resources with us so freely. It is appreciated. Thanks as well to Karen Pighin and her team at the Arts Council and Tracy Hewgill and her team at Community Living for helping us get the posters printed and distributed in our communities. Feel free to download them and distribute them through your organization or business. Thanks for your help. Register NOW for the 2014 Community Resource Fair. This year’s event will take place October 18th, 2014 from 11 AM – 3 PM at the Haney Place Mall. Please read 2014 CRF Registration Letter to learn more about participation guidelines and insurance requirements. Questions? Contact Angie McLeod, Fair Coordinator at info@crfconnect.org or call 604.476.2447. As per tradition, the 2014 Community Resource Fair will be held on the third Saturday in October. This year that means that you need to reserve October 18th, 2014 to attend this exciting Fair. Interested in helping to plan the 2014 Community Resource Fair? Email Bob Sutherland or Sharon Sargent at info@crfconnect.org to get involved. Official planning starts in April / May. Great Exposure. Great Partnerships. Great Connections. These were the words written in the final evaluations from the 2013 Community Resource Fair participants. With the goals of connecting residents with the local service and business resources and connecting these service agencies and businesses with each other, the Community Resource Fair is a great promotional opportunity for those involved. 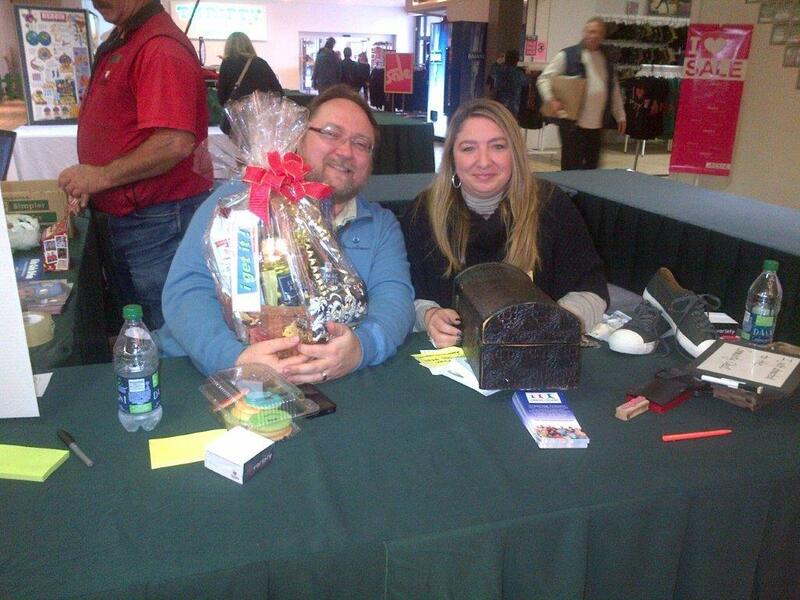 Interactive displays and booths, entertainers, and door prizes help draw visitors through the mall. During the [Community Resource Fair] I heard comments from Exhibitors, Mall Retailers, and the general public. In almost every instance they were happy with the introduction and presentation of the fair, and felt the final product to be a success. Both Sutherland, and Jetty Prins, Coordinator for the Community Resource Fair extended thank you’s in their Final Reports to the many team members, supporters, and partners who helped to make this year’s event so much fun. 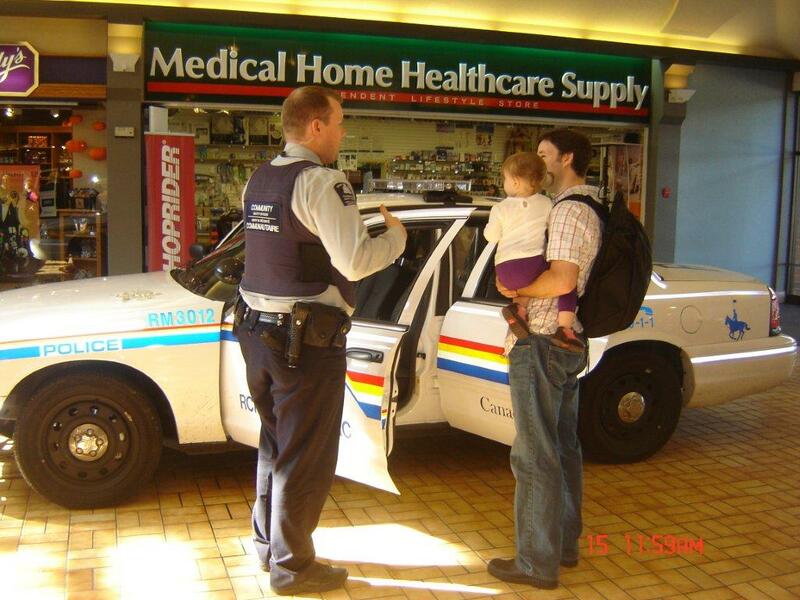 Welcome to the Maple Ridge Pitt Meadows Katzie Community Resource Fair website. At this exciting event you will connect with people from local community groups, agencies and businesses and learn about what’s available in our community. Programs and services for children and families, youth and seniors will be highlighted. Learn about safety and policing, health and wellness, plus much more at this interactive event! Mark Saturday, October 15th between 11:00 AM – 3:00 PM on your calendars and be sure to stop by the Haney Place Mall for the afternoon. Come to find answers to your health, wellness and safety questions. Stay for the fun activities and entertainment! For more information check out the website or contact the Fair Coordinator at info@crfconnect.org.